Photo by J.Ashley Photography. Courtesy of Serenbe. What: Teens can get a visceral sense of the AIDS epidemic’s impact in this groundbreaking show, which makes its only Southeastern stop at Kennesaw State University’s Zuckerman museum. The exhibition explores how AIDS affected American artists and their work from the early 1980s through today. What: Budding archaeologists (and Indiana Jones fans) can decode Mayan glyphs, study jungle creatures, identify Mayan constellations, and uncover treasures in an ancient tomb in this traveling exhibition. What: Dress up as your favorite character and bring a picnic for this event, featuring storytelling and garden crafts. 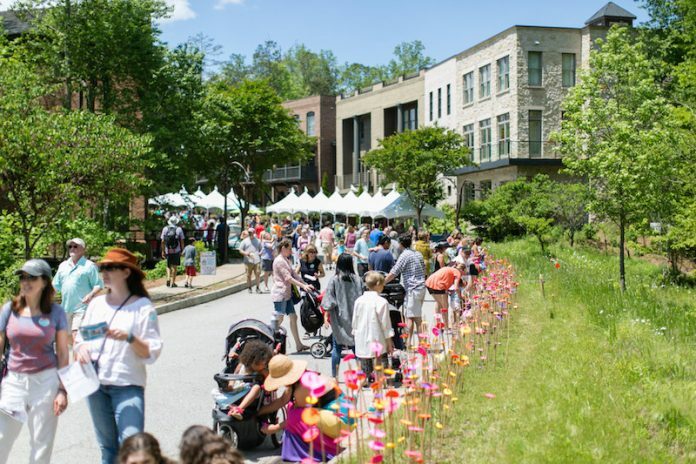 What: Celebrate spring at Serenbe with food trucks, live music, strolling performers—even an honest-to-God May Pole. A special children’s area will offer pony rides, face painting, bouncy slides, and other kid activities. What: Hop aboard the Heart of Georgia Engine, take pictures with train conductors, see tractors and big trucks, and take a short ride across Lake Blackshear. There will also be bouncy houses, mini-golf, Smokey the Bear, a bean bag toss, and plenty of eats. What: Infinite Energy Center plays host to not one, but two ballet productions of the kid-favorite fairy tale this month: first by the Buford School of Ballet, then two weeks later by the Northeast Atlanta Ballet. What: Get the whole gang paddling in this 90-minute introduction to canoeing at Beaver Pond. Ages 5 and up. When: 12 p.m. to 5 p.m.
What: Get gratis admission to the museum, have your family portrait taken, and catch an abbreviated family-friendly performance of the Atlanta Opera’s Pirates of Penzance. During a special members-only hour from 11 a.m. to noon, there will also be Eric Carle story times, art-making workshops, and yoga for adults and kids. What: BYO homemade lantern (or learn how at one of the city’s workshops) and let it shine as you march to Decatur Square. The Black Sheep Ensemble brass band will supply the soundtrack. What: Learn about the garden’s local conservation work and get up close and personal with some unusual critters. What: See circus performers and antique fire trucks, build a phoenix puppet, play “fire in the corn hole,” take part in a guided bicycle tour, and enjoy live jazz and gospel music at this second annual celebration in the Old Fourth Ward. What: Encourage your very own young Indiana Jones with archaeology-themed crafts, activities, and educational demonstrations. What: When else can you get nearly-courtside seats for a pro basketball game for less than $50 apiece? Catch the WNBA team’s home opener, and you’ll have money leftover for hot dogs. What: Fourteen Disney princesses will be on hand to pose for pictures and sing a musical medley, while little royalty-obsessed guests enjoy a sit-down tea (served in real porcelain cups) and participate in a princess parade. All proceeds benefit Girl Talk Inc., a peer-to-peer mentoring program for tween and teen girls. What: Check out the High’s Eric Carle exhibition, then bring your picnic blanket out to the piazza for food trucks, face painting, arts and crafts, and more. When: 10 a.m. to 2 a.m.
What: This all-ages anime, gaming, and comics convention has costume contests, film screenings, workshops, and (let it goooooooooo!) a Disney sing-along contest. When: 10 a.m. to 6 p.m. (Saturday); 11 a.m. to 5 p.m. (Sunday). Kids festival is 9:30 a.m. to 2 p.m. on Saturday. What: Learn about Dekalb county history, stop by the comedy tent, groove to live music, and stroll the artists market. The Kids Festival (at the Decatur Rec Center) kicks off on Saturday morning with a parade, followed by arts and crafts, juggling, balloons, inflatables, and other tot-approved activities.